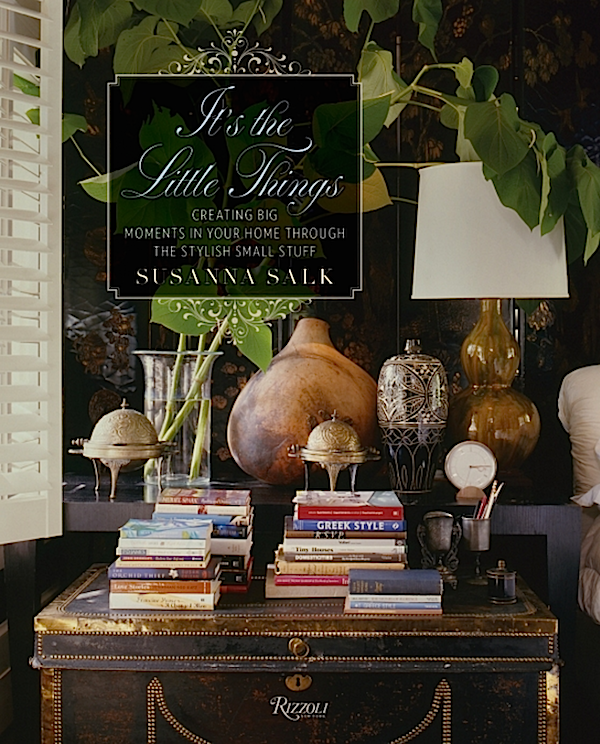 “In my own home, it’s the combination and juxtaposition of meaningful details that bring emotion to every room and make me happy every time I see them.” So explains Susanna Salk in her latest title, It’s the Little Things. In the book Susanna successfully celebrates those details in our homes where we express ourselves the most and where our memories, our personality and our style come alive. With a wonderfully diverse selection of designs, It’s the Little Things illustrates how “creating big moments in your home through the stylish small stuff” is an essential step into making your home your own. While black and white is always a chic combination, the bar is raised in this bedroom by Bibi Monnahan with the great details. Glamorous yet whimsical, the Fornasetti plates and mindful mix of textures and pattern add a playful exchange appropriate for anyone from stylish teen to lucky guest. 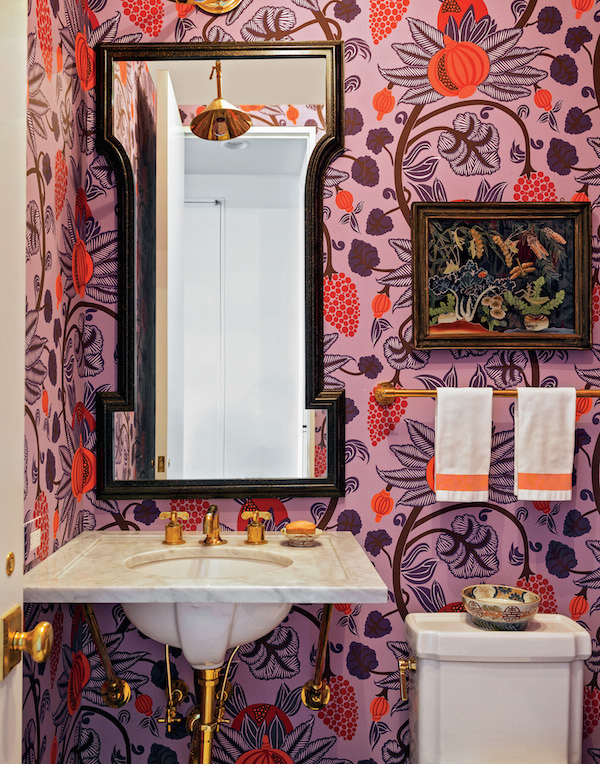 “We always think of small powder rooms as little jewelry boxes where we can use explosive color,” states the color-and-pattern-loving Tilton Fenwick team. And indeed, the bright hues and bold scale of the wallpaper make what could have been a boring box into a scintillating spot to powder your nose! 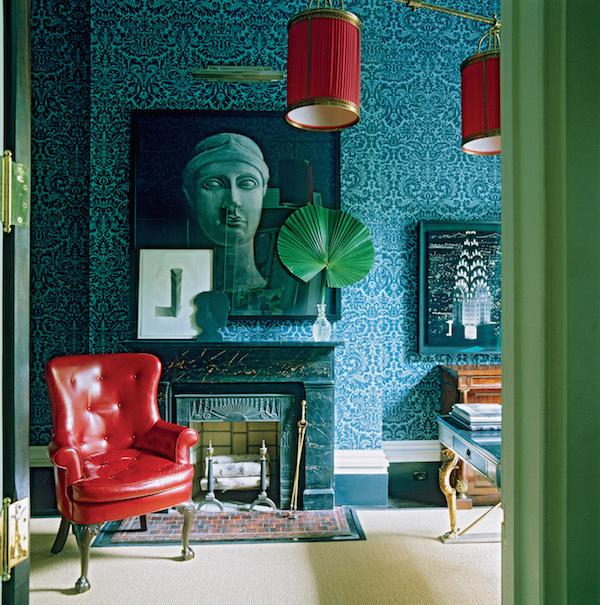 As Susanna so eloquently explains, “Miles Redd composes rooms the way F. Scott Fitzgerald composed sentences: with a dash of wit, punctuating color, lyrical romance and glamour with just a bit of edge.” It’s the masterful mix of design details that make this stunning scene sing. With her love of coral and bold colors, Susanna was perfectly suited to this stylish bedroom in Timothy Corrigan’s magnificent chateau when we visited two years ago. 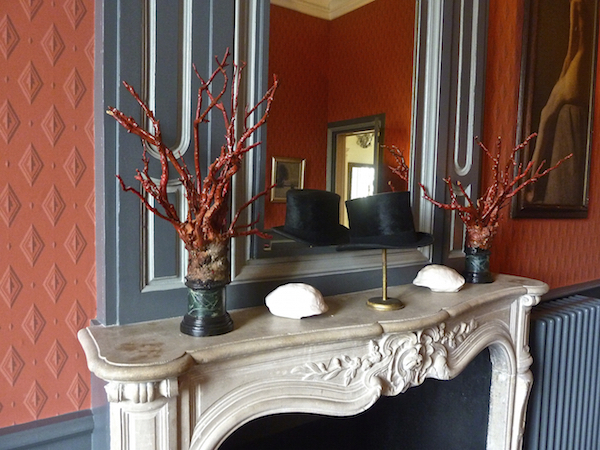 The unexpected mantel display adds a level of charm and whimsy to the formal French architecture. 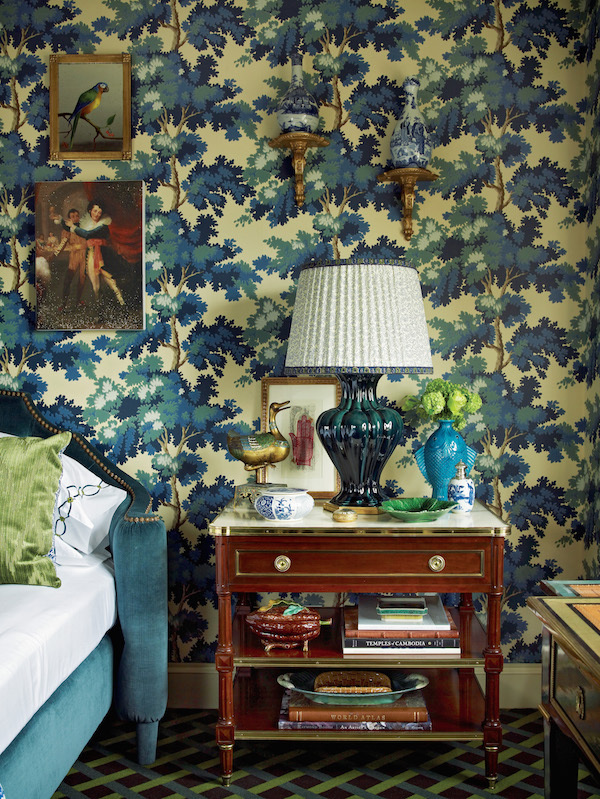 Your initial reaction might be that it’s the stunning wallpaper alone that makes the space in Alex Papachristidis‘ own bedroom. It wouldn’t, however, be nearly as cozy, interesting or polished without all the finishing touches that complete the personal picture. Note the variety of decorative details, from porcelains to paintings, and fearless combinations that take this from simply beautiful to truly fabulous. This entry posted in books, design, interior design. Entry Tags: Design Books, interior design, Susanna Salk Bookmark the permalink. What a wonderful book Stacey and Susanna – full of personal insight and inspiration – the narrative is so rich and compelling – honored to have been included among it’s pages! Can’t wait to get this book–Decorate Fearlessly is one of my all time favorites–and I expect It’s the Little Things will be too. Love the layers, the art, the color, the scale and the sense of humor– the entire sensibility is spot on. I find the “little things” the hardest to master in decorating. While I am never at a loss when faced with an empty room, those final touches can be excruciating to nail down. Looking forward to adding Susanna’s latest tome to my library. This looks wonderful! I can’t wait to add this book to my library! Congratulations Susanna! Dear Stacey, thank you for introducing us to Susanna’s new book, it looks so delightful! I cannot wait to enjoy it and add it to my library!! Congratulations, Susanna! I can’t wait to peruse the pages. Eye candy! 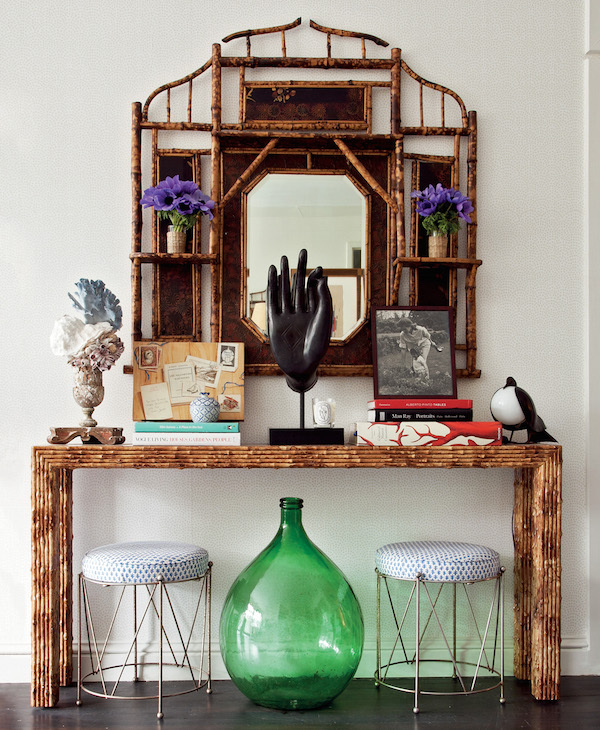 I completely agree – the details definitely make a room, and certainly no ordinary here- each space stunning. Can’t wait to see it all! Beautiful preview. Hope to have it in my hands soon. 81 queries in 0.834 seconds.